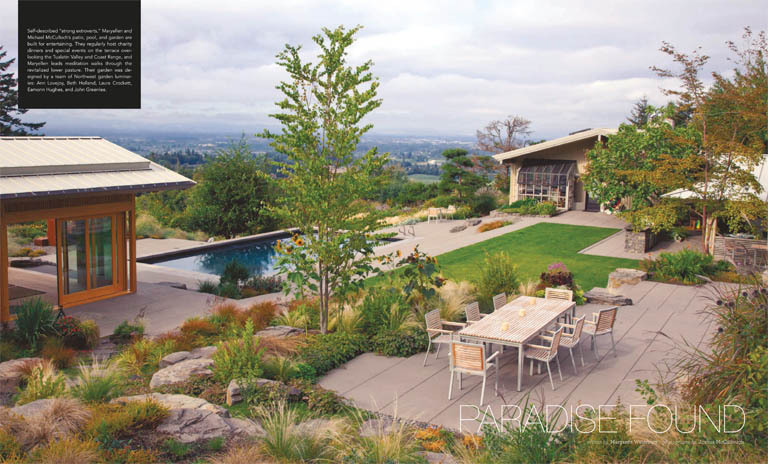 Self-described “strong extroverts,” Maryellen and Michael McCulloch’s patio, pool, and garden are built for entertaining. 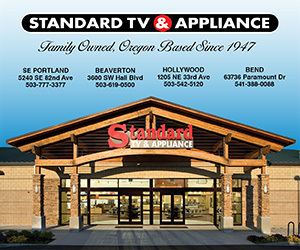 They regularly host charity dinners and special events on the terrace overlooking the Tualatin Valley and Coast Range, and Maryellen leads meditation walks through the revitalized lower pasture. 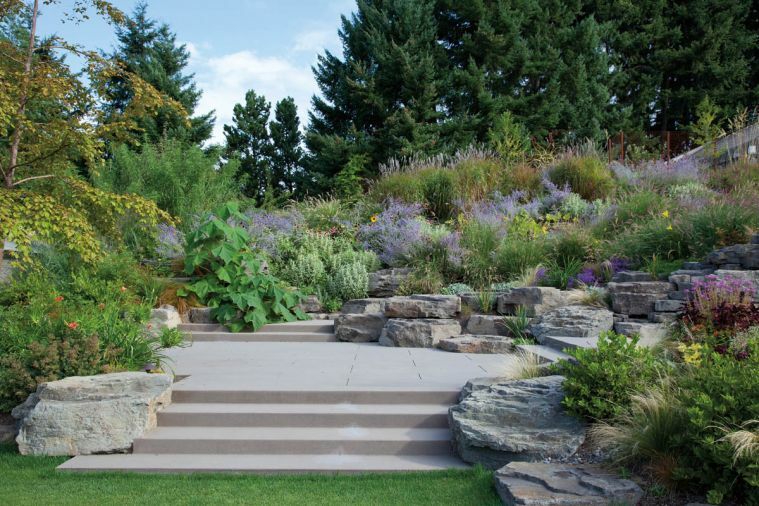 Their garden was designed by a team of Northwest garden luminaries: Ann Lovejoy, Beth Holland, Laura Crockett, Eamonn Hughes, and John Greenlee. 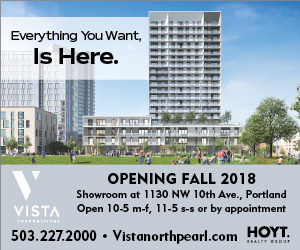 The Japanese-inspired studio opens directly onto the pool. Lush plantings soften hard edges among the hardscaping. Rich jewel tones like the coreopsis, artemisia, and penstemon seen here contrast gorgeously with what Lovejoy calls “oyster light,” the luminous, silvery light of overcast Northwest skies. Native forests provide a borrowed skyline and give rich, dark edges to the garden that provide drama and definition. 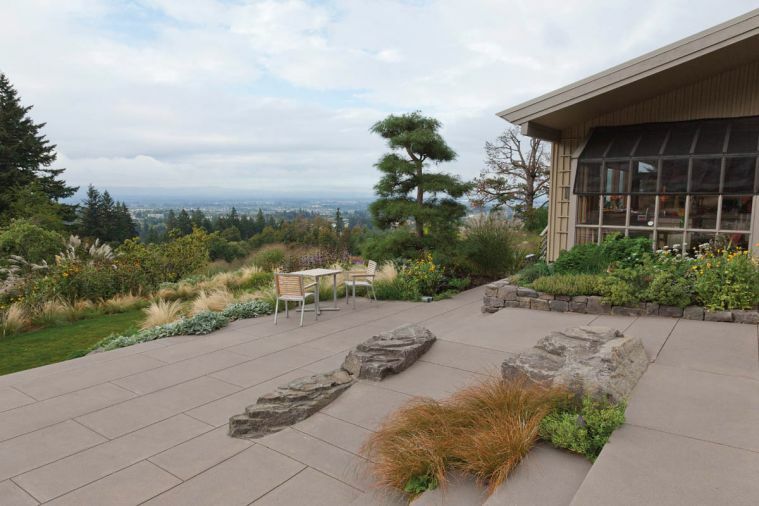 The garden, studio and terrace harmonize with the main house, which was designed by Italian-American architect (and Portlander) Pietro Belluschi. 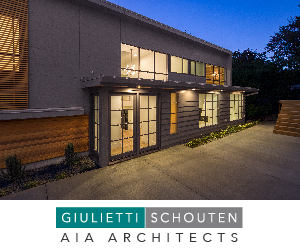 The garden studio’s roofline echoes that of the home, while the rectangular pavers mimic the strong form of the patio-facing windows. 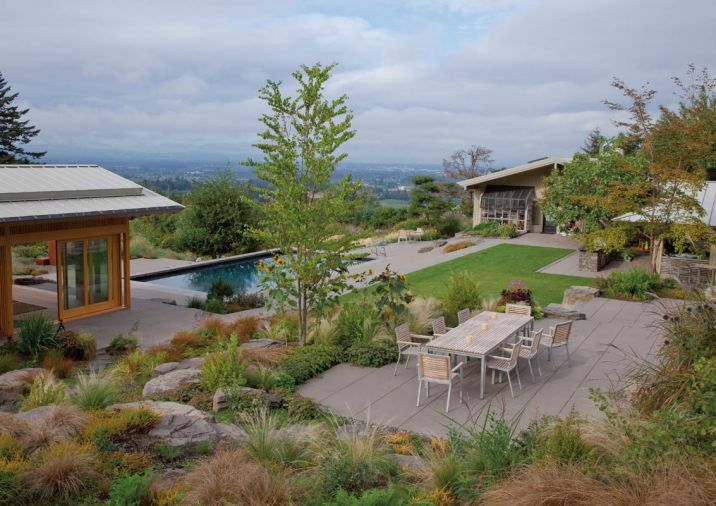 A thoughtful palate of foundation plantings links the home directly to the garden through repetition of form and color. The overall effect is one of great cohesion that belies the fact that the home was built more than 20 years before the garden and terracing was installed. The rocks were imported, and individually placed in the tumbling water feature designed by Eamonn Hughes of Hughes’ Water Gardens. 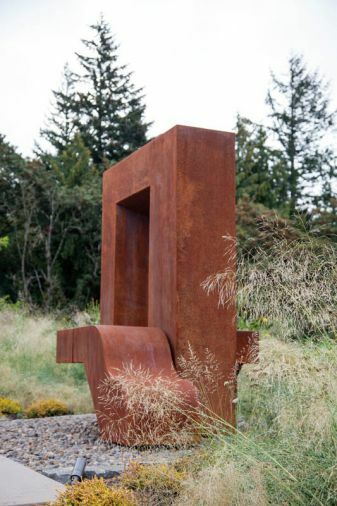 Originally from Ireland, Hughes has been designing Zen-inspired water features like this one in Oregon since 1987. 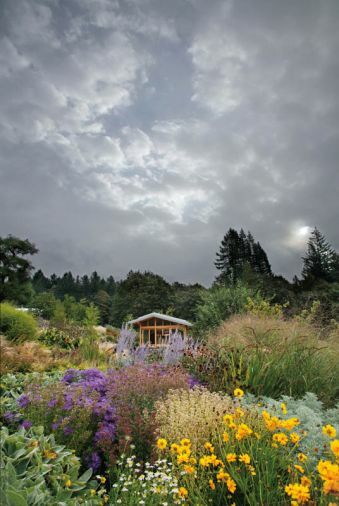 Tucked away in the hills just west of Portland is a garden that masterfully bridges the wild and the refined. 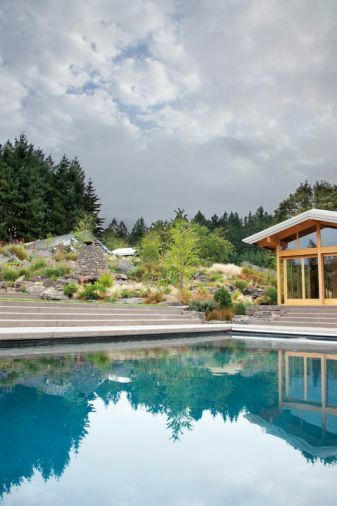 Blending midcentury modern architecture, contemporary hardscaping, naturalistic plantings, native forest, and a Japanese-inspired garden studio, the property exemplifies Northwest design. Once a virtually blank canvas, today Maryellen and Michael McCulloch’s historic home and expansive terraced garden play host to a rotating cast of children, family, friends, elk, birds, bear, bees, and recently even a slinking bobcat darting across the front road. Maryellen, Michael, and their two of their four children have lived on the property together since 2004. Maryellen and her first husband purchased the land as a family home, but he passed away soon afterwards. 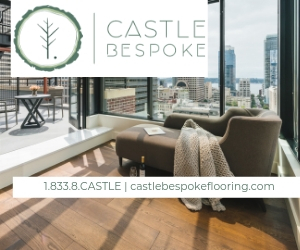 It’s the site of an iconic single family home designed by Pietro Belluschi, one of the Northwest’s most famous architects and a national touchstone in the Modern movement. In the beginning, outside consisted of a sheep pasture blanketed in thistles and several acres of persistent Himalayan blackberry. The McCullochs wondered: What would it be like to have the ideal situation for children to grow up in and adults to enjoy? 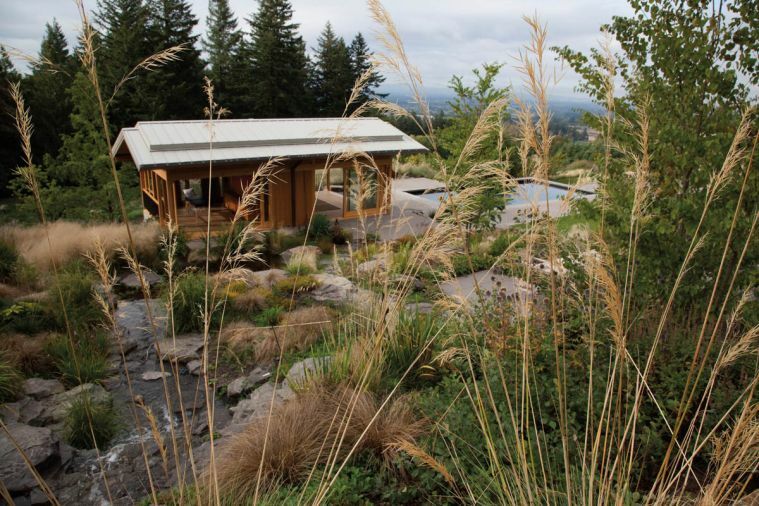 How can this rural setting be transformed into a place for rejuvenation, entertaining, and gatherings while also preserving the natural qualities that make it so special? What kind of garden is this place meant to be? 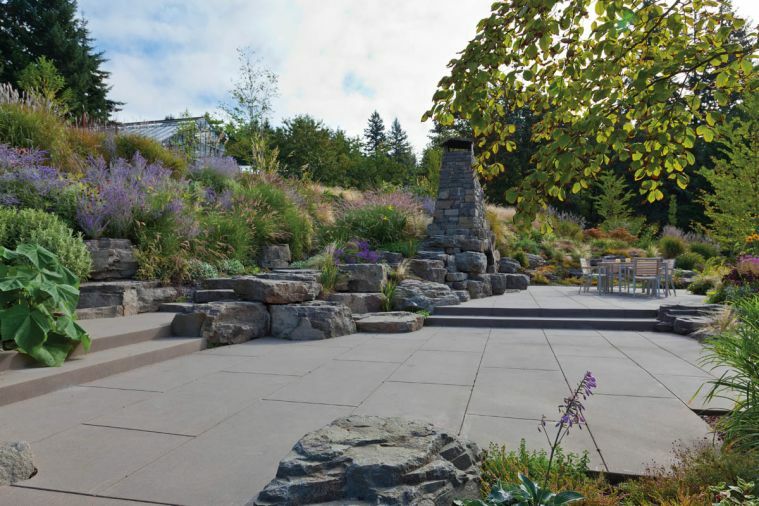 To answer these questions, the McCullochs enlisted an all-star cast of Northwest garden designers, including Ann Lovejoy, Beth Holland, and Laura Crockett. Together, they chose a hot color palate incorporating reds, oranges, yellows, and deep purples, and then put together a planting scheme for a four-acre core around the home. Eamonn Hughes of Hughes’ Water Garden designed and installed the water feature adjacent to the garden studio, including individually placing all one thousand tons of rock brought in to the property. 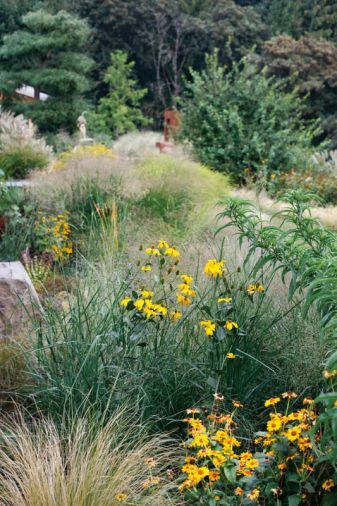 Coreopsis, artemisia, Russian sage, penstemon, lamb’s ear, yucca, sedums, and a wide range of ornamental grasses all feature prominently in the landscape. The designers selected for tough, resilient plants that could coexist successfully with the native elk and deer without aggressive interventions, as well as habitat plants for birds and insects. More recently, the McCullochs have partnered with John Greenlee, considered the international expert on grasses, to expand the garden’s reach. Taking a light-handed editorial approach, they’re now carving trails through the former sheep pasture and removing invasive plants like thistles so that guests can better enjoy the existing grasses. The naturalistic approach even extends to the buildings in the garden. 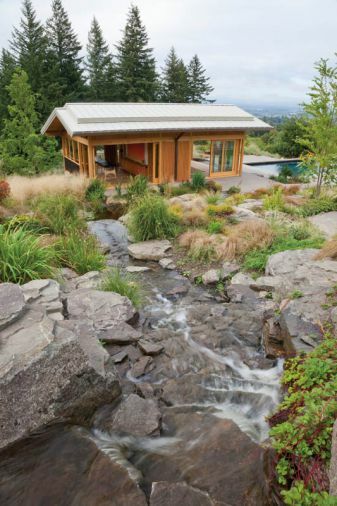 As an architect, homeowner Michael McCulloch designed the garden studio to complement the house. It was built using Japanese temple construction techniques, which eschew nails in favor of a puzzle piece-like approach to building. Every component of the studio frame was laboriously prepared over a period of six months and then, in one day, assembled completely in place without a single nail. “On assembly day, they were so nervous,” says Maryellen, “but it went together perfectly.” Today, the studio is used for yoga, intimate gatherings, events, and concerts, when Maryellen slides open all four walls of the building to create a magical outdoor pavilion.